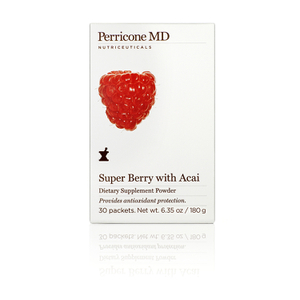 Perricone MD present the Super Greens Supplement Powder; a dietary drink formula to support general wellbeing, free radical damage and immunity. Presented with single-serving packets for convenience, the Super Greens powder harnesses micronutrients found within whole foods to help improve health, body and skin. Dr. Perricone’s exclusive Nrf3 Antioxidant Support Complex™ activates antioxidant pathways, enabling enhanced preservation of skin. It’s made from a natural complex of Tumeric, Olive Leaf, Green Tea and Cress Sprouts, which work in tandem to support skin’s natural ability to combat oxidative stress and environmental aggressors. A powerhouse green blend including Spinach, Kale, Broccoli, Spirulina and Parsley boosts daily nutrition levels, brimming with antioxidants and vitamins, while additional B Vitamins seek to enhance mental focus. Non-GMO. Vegetarian and vegan. Free from artificial colours and preservatives. Mix one packet with one glass of water. This is an awesome and versatile product. I can mix it with water, milk, green smoothies and still they taste good and healthy. When I have this everything, my skin becomes less prone to breakouts and becomes smoother with less/none acne before period. It's a bit pricey but it's worth the money. Better results than some skincare products I believe.